Dave Henault of Ocean State Tackle with a bonito he caught Monday off the west wall of the Harbor of Refuge aboard On-the-Rocks Charters with Capt. Rene Letourneau. 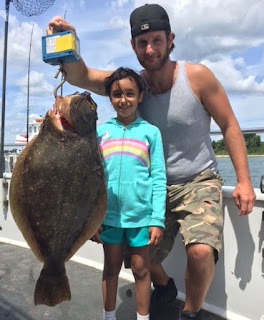 Eight year old Tatiana Trouge from Ansonia, CT with the 30 inch, 9.5 pound fluke she caught this past Friday morning using a whole squid bait on the Frances Fleet. Jack Leyden of North Kingstown with a black sea bass he caught Monday with a weighted eel in 50’ of water on the southwest ledge, Block Island. Gisele Golembeski with a mean looking 8 pound, 10 once summer flounder (fluke) she caught off Block Island Monday using one of her home made jigs tipped with squid and white fluke belly strip. 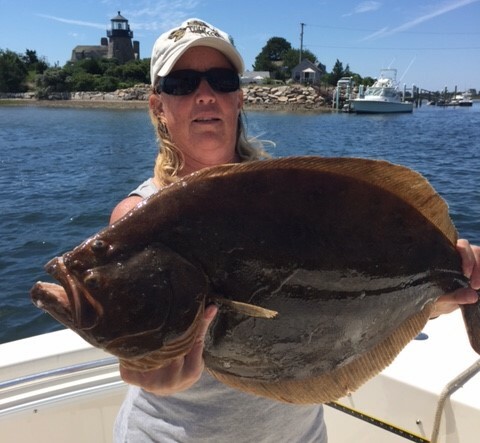 Sandra Tompkins from Ashaway, RI with the 6.5 lb pool winning fluke she caught last week aboard the Gail Frances. “The reels are screaming. We’ve had a number of pick-ups.” said the crackling voice from the water Monday morning. “I just caught a six pound bonito. It has been great but we have been fishing hard since 4:30 a.m.” said Dave Henault of Ocean State Tackle, Providence. 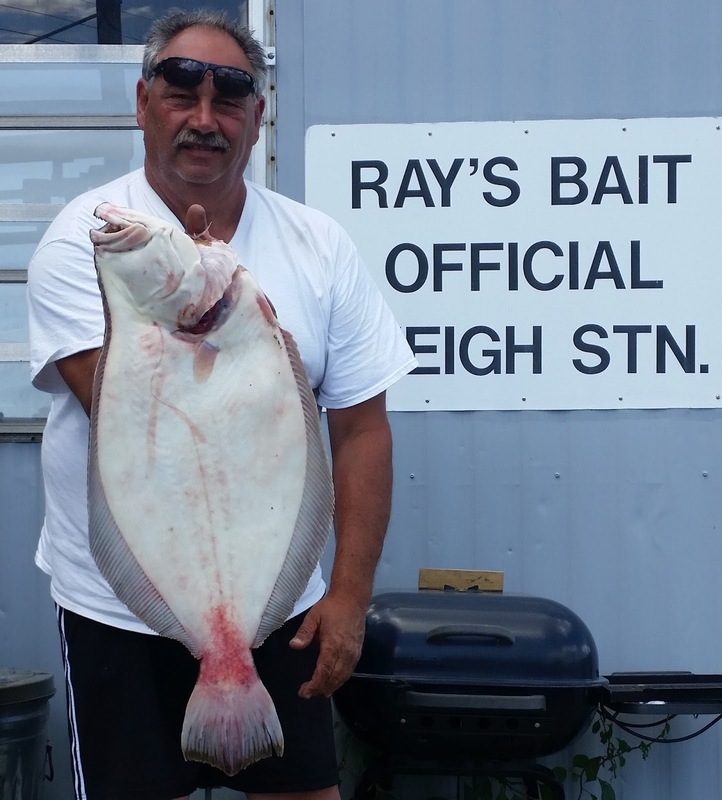 Monday he fished off the west wall of the Harbor of Refuge to Nebraska Shoals with Capt. 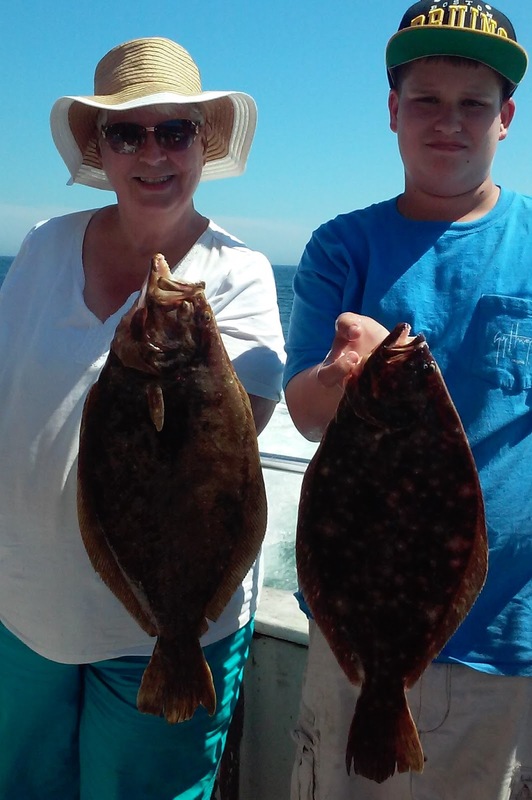 Rene Letourneau, On-the-Rocks Charters. “Bonito have been around for a few weeks with commercial fishermen finding them in their traps.” said Dan Costa, Department of Environmental Management Port Manager at Galilee. With an influx of schools of bait fish, the bonito have been feeding in the upper levels of the water column and anglers have been catching them. Why was the striped bass limit cut to one fish? Why are you allowed to take 9” scup from select shore areas and the minimum is 10” from a boat and other shore areas? And, why have we been restricted to one black sea bass all summer? The answer to these and similar questions lies, in part, with the National Oceanic and Atmospheric Administration’s (NOAA) ability to manage and prioritize fish stock assessments for recreational and commercial fisheries so fish managers can make decisions based on the best available scientific information. Earlier this month NOAA released a final version of a new stock assessment prioritization system. NOAA manages over 500 fish species nationally but only has the recourses to conduct about 200 fish stock assessments a year with its partners. So, they had to develop an objective and transparent way to prioritize assessments. Key factors that go into assessment decision include the status of stock, the importance of the fishery to recreational and commercial fishery, available assessment information and the species ecosystem importance. For information on stock assessments in our area (the Northeast Region) visit www.nefsc.noaa.gov/saw . Striped bass bite around Block Island remains very hot, particularly from the Southwest Ledge to the Southeast side of the Island. 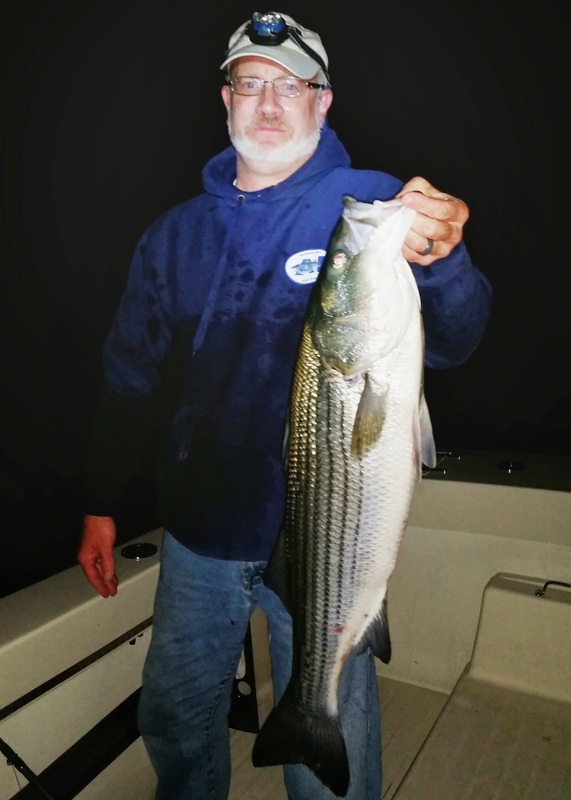 Angler Eric Appolonia of North Kingstown said, “My son, his friend and I had no trouble catching our limit of bass in an hour Friday trolling with tube and worm in 40 to 45 feet of water at the Southwest Ledge. 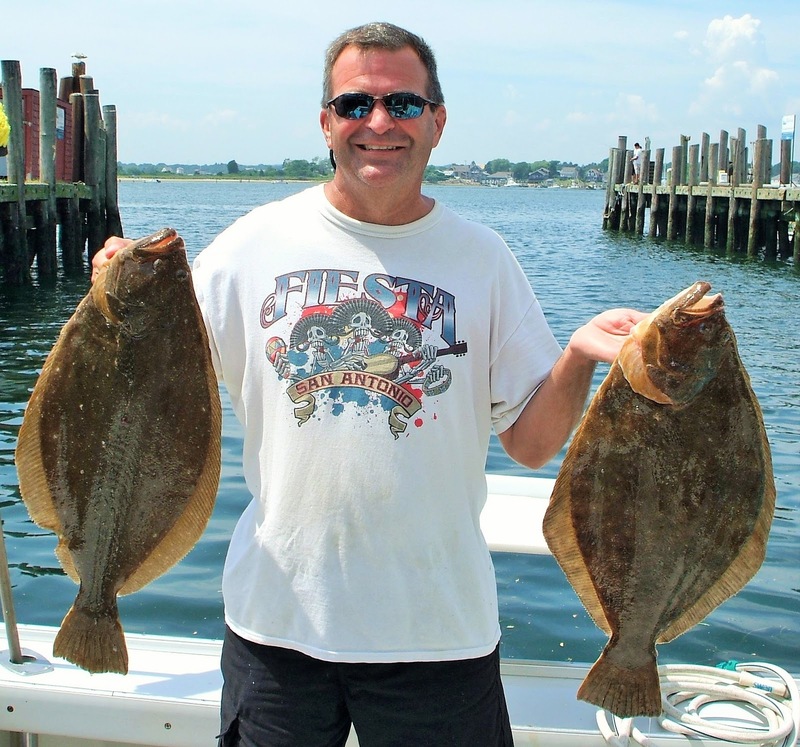 We released two fish and kept one and then turned our attention to fluke fishing of the south side of the Island.” Angler George Allen reports a good bass bite off Newport trolling tube and worm with lead core line. George said, “We landed three bass a 13, 23 and 24 pound fish.” “School bass are being caught in the Taunton River.” said Mike Bucko of Bucko Bait & Tackle, Fall River. “The bass bite at Block Island is still crazy. The wind this week slowed anglers down a bit but customers are still going to Block Island and catching big bass.” said Manny Macedo of Lucky Bait & Tackle, Warren. Bluefish bite has been good. “We have many large bluefish in the Bay but they seem to be running deep. Anglers are catching them with bucktails when bass fishing. Last week we weighed in a sixteen pound bluefish.” said Greg Bruning of the Tackle Box, Warwick. Manny Macedo of Lucky Bait & Tackle said, “The bluefish are all over the East Passage.” Angler George Allen caught four large blue fish when trolling with tube & worm for bass off Newport. Shore fishing has been good in RI. Mike Cardinal of Cardinal Bait & Tackle, Charlestown said, “The bass bite has been good from shore and the Charlestown Breachway as well as from boats.” Mary Dangelo of Maridee Bait & Canvas, Narragansett said, “The school bass bite with keepers mixed in has been good at the east wall of the Harbor of Refuge. Snappa blues and school bass are being caught at Pier 5, Black Point and the mouth of Narrow River. Kayakers are having luck trolling tube & worm with shore anglers having success with all types of lures and bait with clams and squid being the top bait choices. The bite is focused around sun up and sun down.” Christian Silvia of Watch Hill Outfitters, Westerly said, “We have a lot of big bass in the area. A customer got spooled four times when fishing from the Weekapaug Breachway (Westerly) this week at night using eels and they are catching bass at the Watch Hill Light too.” The scup bite has been good in the Bay with shore anglers landing scup from bridges and docks in Warwick, Warren, Barrington, Bristol and all over South County. Eddy Cogean of Johnson caught a 30”, 12 pound fluke this Sunday at the Jamestown Bridge. 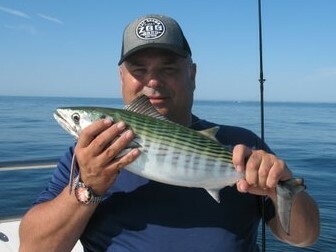 Greg Vespe caught and released his 1,000th striped bass last week at the Southwest Ledge, Block Island. 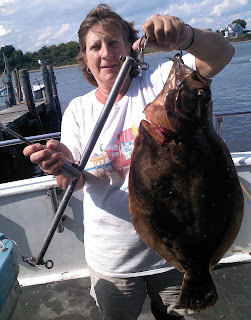 Diane Valerien caught this 9.5 pound fluke fishing on the Jeanie B charter boat off Block Island last week. 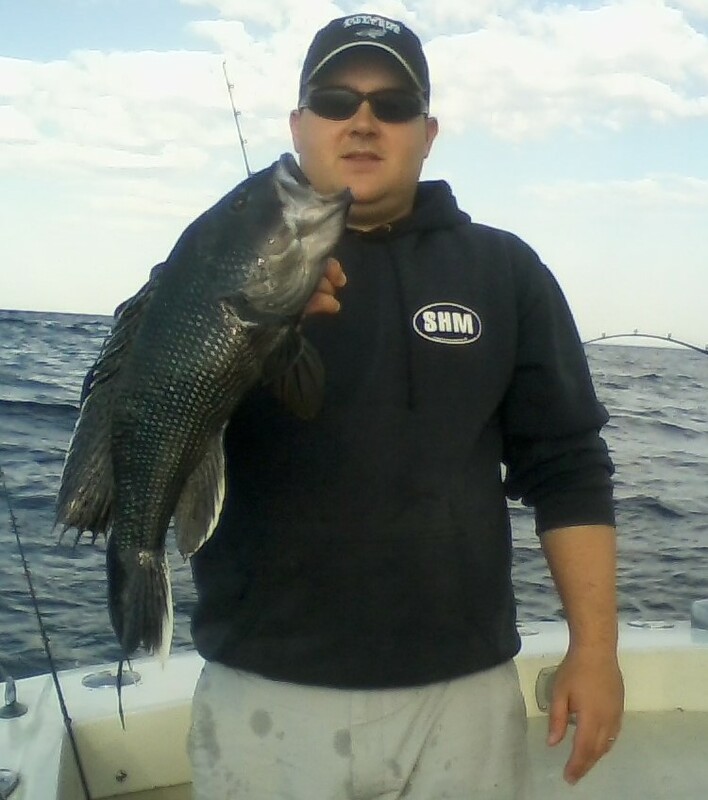 Travis Barao with a black sea bass he caught off Newport Saturday. Veterans Eddy Dusick, Milford, CT and Marc Mexzina, Pawtucket, RI (with hat) fish aboard the charter fishing vessel Bare Bones captained by Steve Anderson. 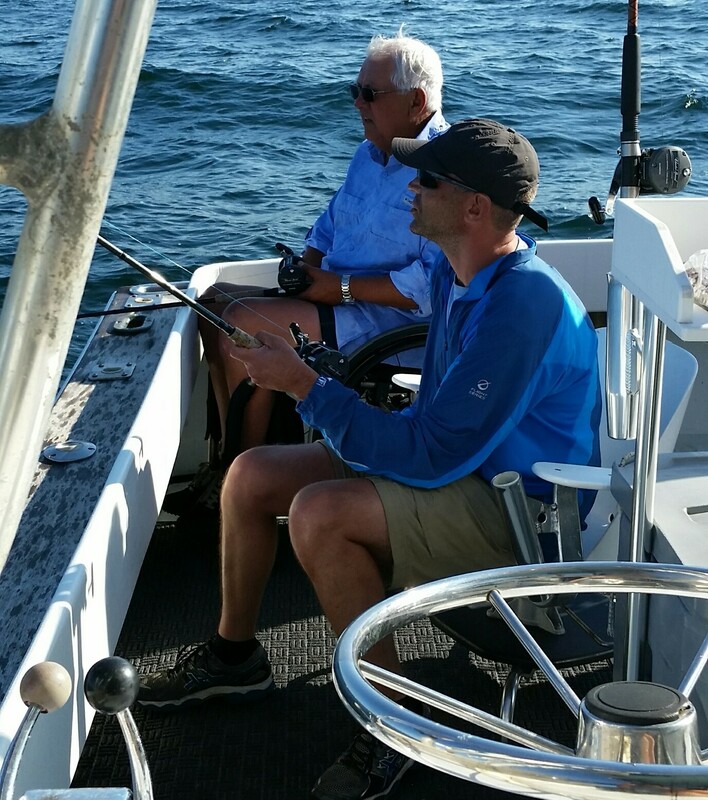 Bare Bones and other charter boats from the RI Party & Charter Boat Association donated their time to take veterans with disabilities fishing last week. Mike Warner was a guest of Bob Murray on his boat Skip Jack and they had a very successful fluke trip to Block Island where Warner caught fluke to 8.1 pounds. Ginny Reed, Bristol, RI and Cole Beaudreau, Coventry with two of the jumbo fluke they caught on the aboard the Frances Fleet. 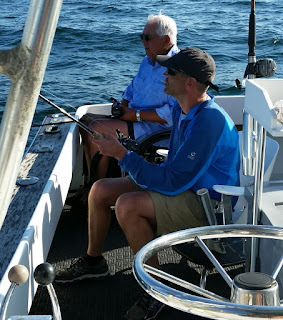 Veteran Eddy Dusick of Milford, CT with mate Eric Anderson fished for fluke and black sea bass aboard Bare Bones Charters from the RI Party & Charter Boat Association. What if you lost your leg? Or an arm? How active would you be? You might say you would be a bit timid about pushing yourself and participating in outdoor activities. The Providence and Boston Veterans Administration is helping wounded veterans and veterans with disabilities learn how far they can go enjoying outdoor activities. Outdoor activities they might think they can no longer do like kayaking, flying kites or fishing… yes fishing. 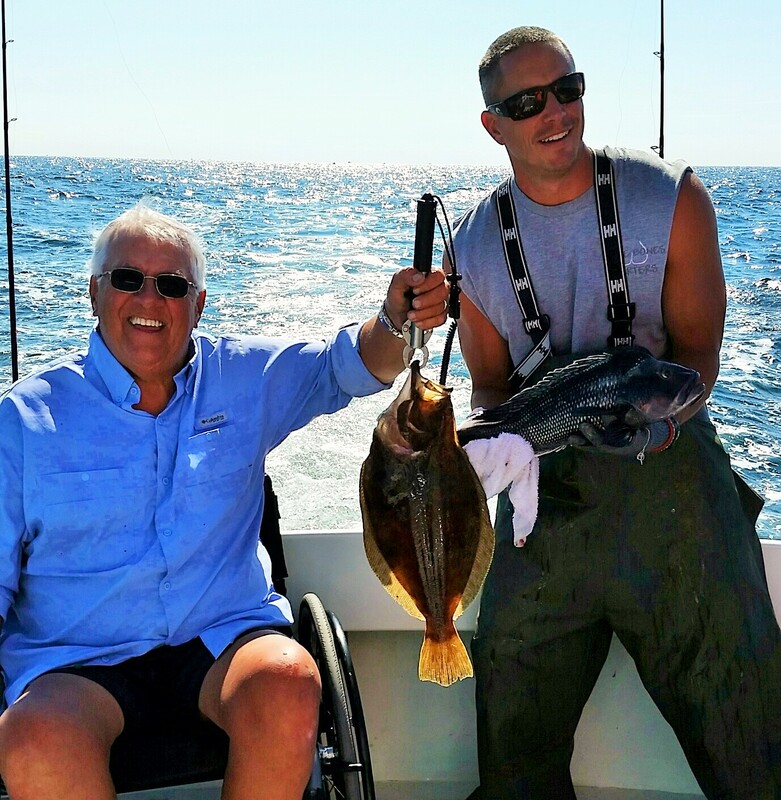 Last month the Rhode Island Party & Charter Boat Association (RIPCBA) members donated their time and fuel to take 50 veterans, many of them with disabilities, family members, friends and care givers out on twelve RIPCBA charter fishing vessels. Scientists from the Department of Environmental Management (DEM) are monitoring a large fish kill of adult menhaden in the Seekonk and Providence Rivers. Based on field observations and water quality measurements, the ongoing incident is being caused by low oxygen levels in the bottom waters. Menhaden are often pinned in by predators like bluefish that attack them when they attempt to move out of these poor water quality areas, forcing them to remain in these low-oxygen areas. Reports early last week indicate that dead menhaden are being found along the East Providence shore in the Providence River. This suggests that the low-oxygen water has extended further south and is affecting the lower Providence River this week. A survey of the upper third of Narragansett Bay by Brown University and the University of Rhode Island will be conducted this week. Scientists will have a better picture of the extent of the hypoxia when that data is available. The Narragansett Chapter of Trout Unlimited (TU225) will host its regular monthly membership meeting on Wednesday, August 26, 2015, starting at 5:00 PM. This meeting will be the last of the streamside meetings for 2015, and will be held at the RIDEM Deer Check Station in the Arcadia Management Area in Exeter, RI. 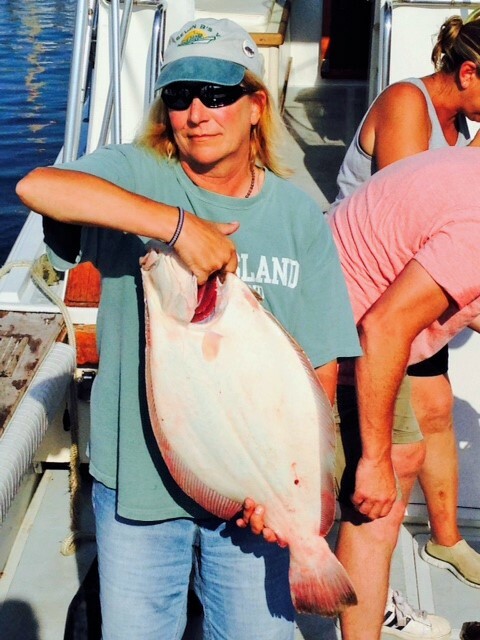 At the August meeting TU 225 members and guests will share fishing stories. A fly fishing rod and a variety of related items will be available for bidding. Fish before and/or after the meeting, but please be considerate of the fish as they endure low flows and high water temperatures. Contact chapter president, Ron Marafioti, at (401) 463-6162 for information. Bluefish bite is strong in the Narragansett Bay and along coastal shores. “The entire East Passage of the Bay seems to have lite up with bluefish. Many of them are large in the 3 to 8 pound range. They are at Barrington Beach to Halfway Rock and you can’t help catching them. Anglers are trolling tube and worm as well as using lures of all types. Some were using soft plastics but they were getting chewed up pretty quick because there were so many hits and switched to Broken Back Rebels, even Kastmaster which were landing smaller bluefish on the cast.” John Littlefield of Archie’s Bait said “Big blues are being caught from the shore at Sabin Point, Barrington Beach and Nayatt Point.” Phil Matteson of Breachway Bait said blue fishing is excellent from the shore and from the Breachway and snapper blues have arrived in Ninigret Pond. Black sea bass are being caught by anglers when fluke fishing. 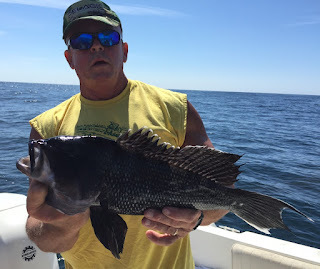 Gil and Travis Barao and their friend Dan had no trouble catching their limit of one black sea bass each off Newport Saturday when fluke fishing. The one fish limit at 14” has been in place since July 2, however the limit increases to seven fish/person/day on September 1st.